With this journey, we invite you to discover the exotic, authentic and colorful Sapa in northern Vietnam. Amidst its spectacular settings, with little stilt houses nestled in mountains doused in lush vegetation, meandering rivers shrouded in streams of fog and amazing terraced rice fields descending into flowery valleys, you will meet ethnic people. 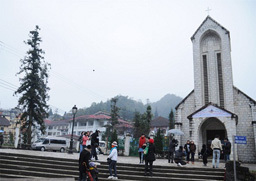 Sapa is home to many ethnic groups such as the Black H'mong, Dao Reds, Nhang and XaPho. They live peacefully together while maintaining their own customs and traditions, especially their colorful costumes and vibrant ethnic weekend markets. 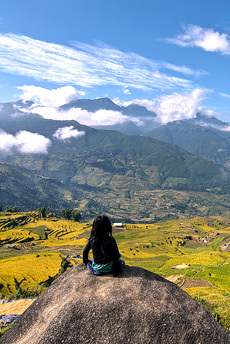 Sapa provides the perfect setting for trek of your dreams! Homestay: Communicate with local people and explore their culture by participating in their daily activities and sharing meals with them. 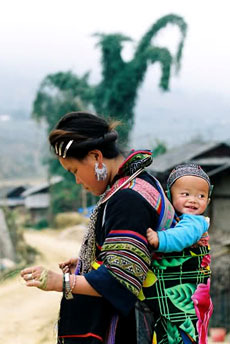 The richness of culture: Sapa has an amazing diversity of ethnic groups, each with its own cultural heritage. This is an ideal trip for tourists with a passion for cultural exploration. 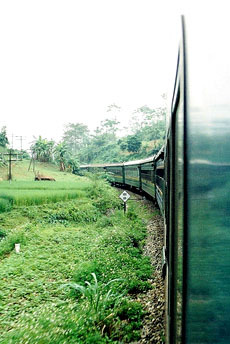 You will be picked up at your hotel and taken to Hanoi train station for the night train to Lao Cai. Depart from the station at 9:00pm. Overnight in the 4 soft berths cabin. Arrive at Lao Cai train station in the early morning and head to your hotel in Sapa for breakfast and a rest. Take a short walk to Y Linh Ho village,situated 6km from Sapa, inhabited by Black H’mong and Lao Chai village where you can admire fabulous views of the valley, terraced fields and winding streams. You then stroll along a narrow trail leading to the bottom of the valley, and take a rest. Picnic lunch is served. In the afternoon, you will visit Ta Van village, home to the Dzay ethnic people, located in the heart of the MuongHoavalley. Overnight at a Dzay ethnic homestay in Ta Van. 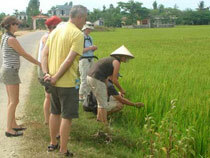 Hike through lush rice paddies, bamboo forests, beautiful waterfalls and over little rattan bridges. Visit Giang Ta Chai village inhabited by the Black H'mong and Red Dao people, who still wear traditional costumes in vibrant colors and adonrned with complicated embroidery. After lunch, transfer to Bac Ha. Overnight at hotel. After breakfast, trek for another 5 to 6 hours through the villages of Flower Hmong ,Dzao, Nung and Tay ethnic people to explore the colorful ethnic mosaic of Sapa. If you are here on a Sunday, a vibrant ethnic market will amaze you. 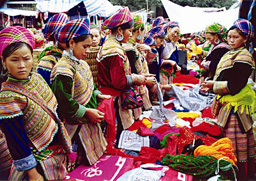 Bac Ha market is also the biggest fair in Sapa with ample opportunity for brocade shopping and taking photos. Return to Lao Caitrain station for the night train to Hanoi. Overnight in the 4 berths soft sleeper cabin. 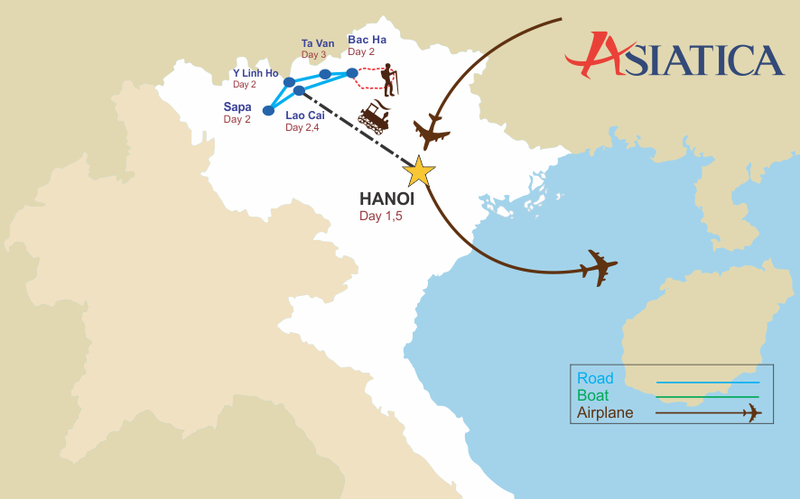 Arrive in Hanoi. Transfer to the hotel. Asiatica Travel’s services end here.